If you wanted Hollywood action in the 1930s or 1940s, your absolute best bet was director Michael Curtiz. He had already directed numerous feature films before 1935, but it was that year that he took an extra named Errol Flynn and cast him as the leading man in the swashbuckler Captain Blood: a huge commercial hit for them both. 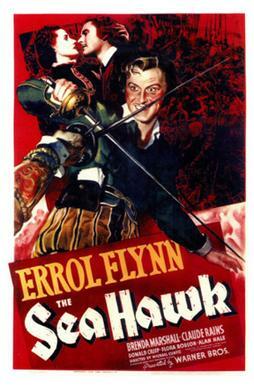 Jump forward to 1940, and The Sea Hawk marks the 10th collaboration between actor and director. It is a tremendous picture. After so much time working together, Flynn and Curtiz function like like a well-oiled machine. The dialogue sparkles. The actors are almost universally charming. The swordplay is impressive, and the orchestral score is arguably the best that Erich Korngold ever composed. While some may feel a little challenged by the black-and-white photography, or the 4:3 screen ratio, and particularly by the very 1940s theatrical acting, when viewed in its historical context The Sea Hawk is as thrilling an adventure as anything Hollywood is producing today. Flynn plays Captain Geoffrey Thorpe, an English privateer who raids Spanish galleons on behalf of Queen Elizabeth I (Flora Robson). With Spain clearly preparing for an invasion of England, Thorpe heads to the Americas to disrupt Spanish interests there. He is betrayed and captured, and must somehow break free to save his Queen from a conspiracy within her own court. The film is purportedly based on Rafael Sabatini’s 1915 novel of the same name, which had already been adapted as a silent feature in 1924. This second adaptation, however, by-and-large abandons the novel’s narrative in favour of one based loosely around Sir Francis Drake. Its cavalier attitude to the source material is matched by its similarly loose take on history. Fans of Elizabethan England will likely be startled to see real-life spymaster and principal secretary Sir Francis Walsingham portrayed by Henry Daniell as a sneering pro-Spanish traitor. Not that this ultimately matters: the core purpose of an adventure film is to entertain its audience, and The Sea Hawk achieves that and more. Errol Flynn is a charming and capable lead, but the real star here is Flora Robson. She plays Elizabeth I in an uncharacteristically upbeat and warm fashion. The steely determination and authority of other actors’ takes is there, but she leavens it with humour and sensitivity. Around them work an ensemble of strong and entertaining actors; notably Claude Rains as the Spanish ambassador, who brings dignity and maturity to round off and expand what could easily have been a one-note villain. The film was clearly made for a lot of money, with big sets and a large cast, and Curtiz makes good use of what’s available. The film’s lengthy opening set piece – Thorpe leads a raid on a Spanish galleon – is excellently staged and paced, and kicks the film off in a strong fashion. From there it’s a familiar but reliable chain of action sequences, romantic interludes, and dramatic plotting. The film’s climax contains well-choreographed and atmospherically shot sword-fighting, which leads through to a stirring and patriotic speech by Elizabeth to her troops. Given the film’s 1940 release, its relevance to British audiences living through German air raids would have been palpable.